Installing a Generator with an automatic crossover. External Generator - Run extension cords to a few devices when in use. Manual crossover of selected circuits. Automatic Crossover of selected circuits. Whole house systems with automatic crossover. 1. It ran on gas: Gas does not store well. I often had to clean the carburetor as gunk from old gas had plugged it up. I did use Stabil in the gas, but it still had problems. Even with Stabil, gas is only good for about a year. 2. It is hard to start cold. Generator did not work well when cold until it warmed up. 3. Switch over was manual. I had a manual setup that was against code. It was possible to damage the generator or accidentally feed power back out the mains. I knew how to use it properly, but would have to remove it for safety or liability reasons if I sold the house. 4. It had no electric start. Power goes out when it is freezing cold and usually wet. Going outside to pull-start the thing is a pain. I wanted something better. I was considering converting it to natural Gas. I would lose some power, but would eliminate the storage problem. I came on a deal for a Generac Guardian 8000VA generator with a crossover switch and sub panel. The generator was installed outside my garage, right behind the breaker panel. I prepared an area with gravel to allow drainage and installed large paving stones as a base. 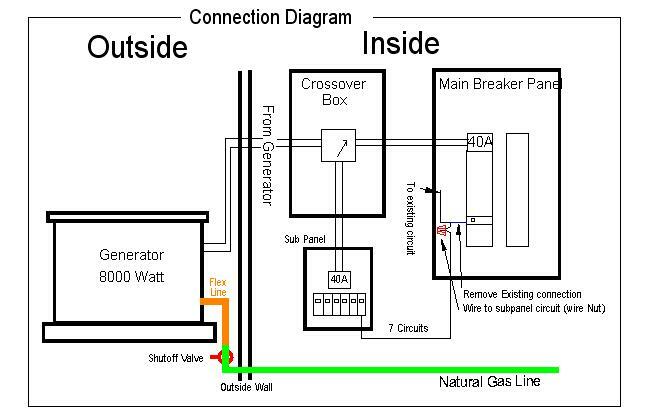 The output from the generator is connected to the crossover box. This is a 35-amp 240V line. An additional 40A breaker was added to the main panel; this feeds the other input to the crossover box. The crossover box feeds a second breaker panel. When power fails, the generator starts automatically and switches power fed to the Sub Panel. Only circuits connected to the sub panel are backed up by the generator. This includes the my office, kitchen lights and outlets and refrigerator, the garage (electric door openers) , the furnace, master bedroom and the living room. The sub panel has a cable that feeds 7 circuits back to the main panel. The selected circuits are disconnected from their breakers and connected to the wires from the Sub Panel. Major appliances are not connected. These include the stove, air conditioner and oven. These require more power than the generator can supply. One thing I did change was adding a main breaker to the sub panel. The original panel did not have one. It was safe as is as both feeds to the crossover box have breakers. 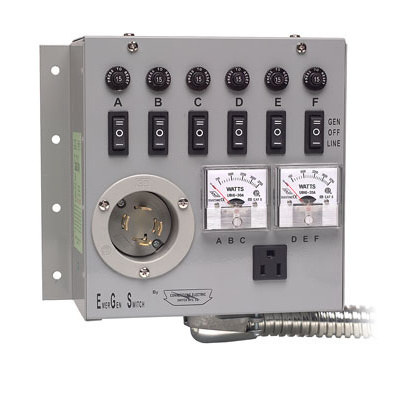 The 40A breaker allows power to be removed from all the sub panel circuits. Last year the control board in the genrator went flaky. I disliked it running a self test every week running up may gas bill. So, I designed my own board with a self test once a month and more features. It is described here. This is the generator, You can see the Gas line and power feed coming in on the right. The white box on the right is where my old generator plugged in, it has since been removed. Still needed are clamps to dress up and protect the cables and pipes. Here's the panels. The transfer switch is huge. 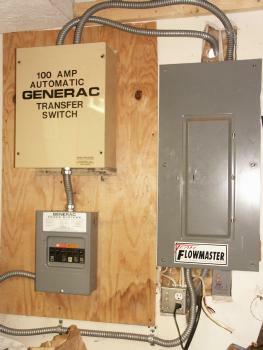 Generac has since come out with a combined transfer switch and sub panel that is one unit and smaller. I added a plywood board to mount the boxes. This makes mounting easier. I still need to clean it up a bit. I will add plywood above and below the main panel to cover the holes needed to connect the cables to the panel. Then add more clamps to keep the cables out of the way. 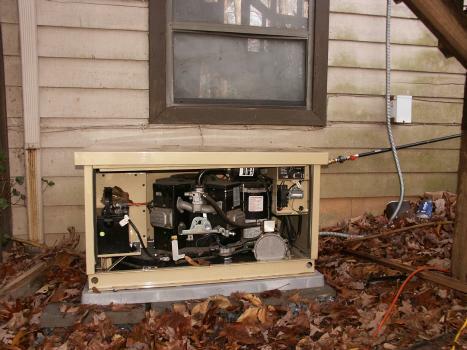 Should you DIY a generator installation? This was not an easy installation. I had problems due to missing parts and damaged cables (hence my deal on the unit.) You can read the problems here. That depends on your skills and the needs. First decide on how big a generator you need. If you have gas heat and water heater, then an 8-15KW generator would probably run everything other than major appliances like the electric stove/oven. and the A/C compressor. If you have a heat pump, you will probably need at least 15KW maybe even 20 or more. My 5800 watt generator ran the refrigerator, lights, the furnace, my office and the living room with no problems. I have gas heat and water heater so the furnace only required enough power to run the blower. My take on this is if you need 7-12KW and can pick 6 to 8 15A circuits, then a crossover system like I have is doable. You would need to be comfortable with electrical wiring. Running the gas line may require a licensed plumber. This is ideal for portable generators as it provides a plug for the generator that can be removed when not in use. I like the meters as it tells you how much power you are using. It cost about $220 and includes detailed instructions. This can be done by a home user without major difficulties. Large systems greater than 15KW usually switch the whole house. These must be installed by a licensed electrician. They may also require a separate gas line and meter as these may require a high volume and higher pressure than your house provides. I would not consider this a DIY project in any situation. These require putting the transfer switch between the power meter and the breaker panel. This must be done by a licensed electrician and usually has strict codes.